Sticky: [OFFICIAL] Post your deals HERE! Sticky: Habbo Down! PLEASE POST HERE! Poll: [Discussion] Permanent Bans - Still 11 Years? [Discussion] How much are you worth on Habbo? [Discussion] Who can you name? [Discussion] Do you own any 'rare' names on Habbo? 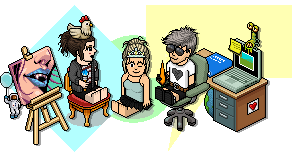 What is your favourite game to play on habbo? [Discussion] How many credits do you have?